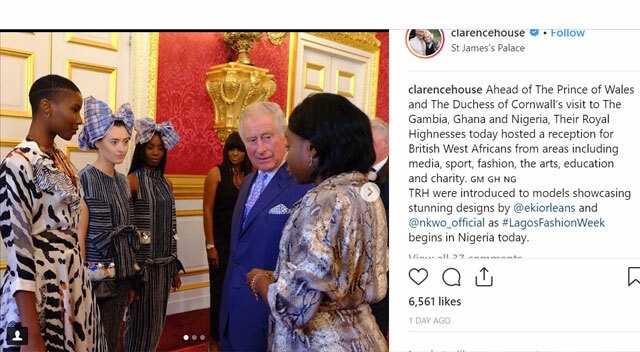 The Prince of Wales, Prince Charles, and his wife, the Duchess of Cornwall, hosted fashion designers from Nigeria ahead of their upcoming tour to Africa. The event, held at the yesterday at St James Palace in London, England, was attended byWest African creatives with models wearing designs from the Lagos Fashion Week, which officially kicks off in Lagos today. The designers whose pieces were showcased include Nkwo, whose designs are made in Nigeria with locally sourced fabrics in northern Nigeria and Eki Orleans whose designs are heavily rooted in Africa and a celebration of the link between Nigeria and the UK. The reception details were shared on the official Instagram page of Prince Charles and Princess Camille. “Ahead of The Prince of Wales and The Duchess of Cornwall’s visit to The Gambia, Ghana and Nigeria, their Royal Highnesses today hosted a reception for British West Africans from areas including media, sport, fashion, the arts, education and charity,” the post read.